Pete (Mark Wahlberg) and Ellie (Rose Byrne) decide to have a foster child as a matter of urgency. After going through a sort of briefing in an adoption company, the couple stops choosing 15-year-old Lizzie. Since the girl has a younger brother and sister, the newly minted parents automatically become large and have no idea what adventure they are embroiled in. 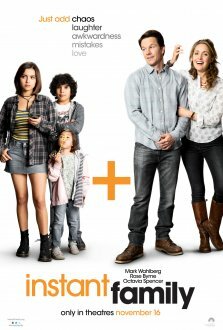 On the one hand, Instant Family is a completely standard, largely predictable comedy about adoption. On the other hand, in the second half of the movie this is more of a drama than a comedy, the authors of which try to tell the audience several important things.